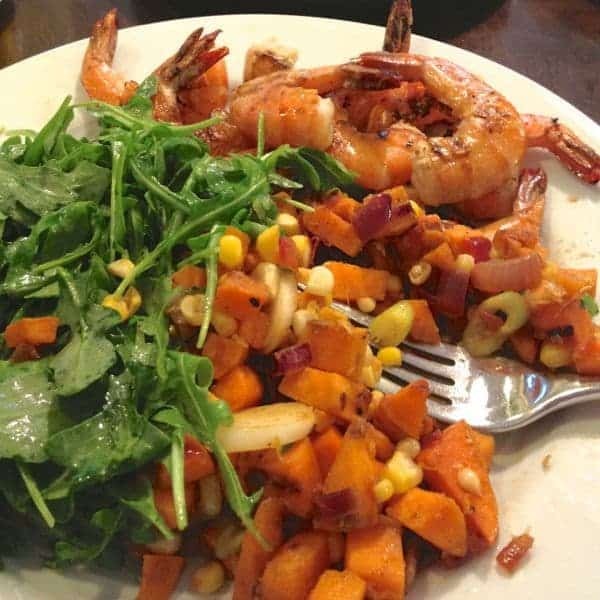 Sweet potatoes are sautéed with corn and onions with a hint of smoked paprika for this quick and easy side dish. Let’s be real: Winter vegetables need a little coaxing before they turn into something spectacular. You know what I’m talking about: beets, cauliflower, butternut squash…they all need a little bit of love before they turn into something delicious, satisfying and nourishing. 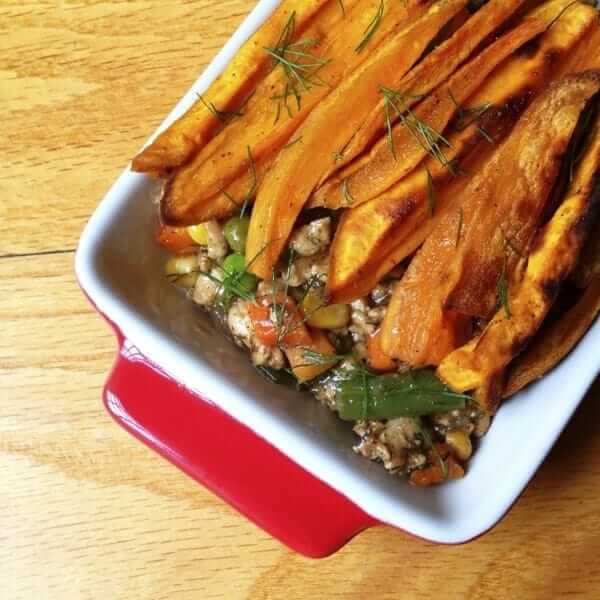 We almost always have sweet potatoes on hand during the colder months of the year but I’m always looking for a new way to enjoy them. 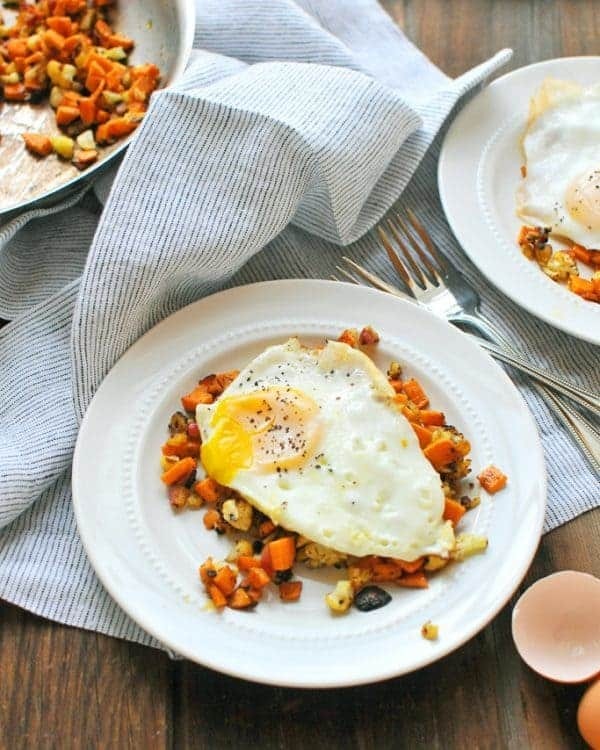 This hash not only fit the bill but it couldn’t be easier to make. 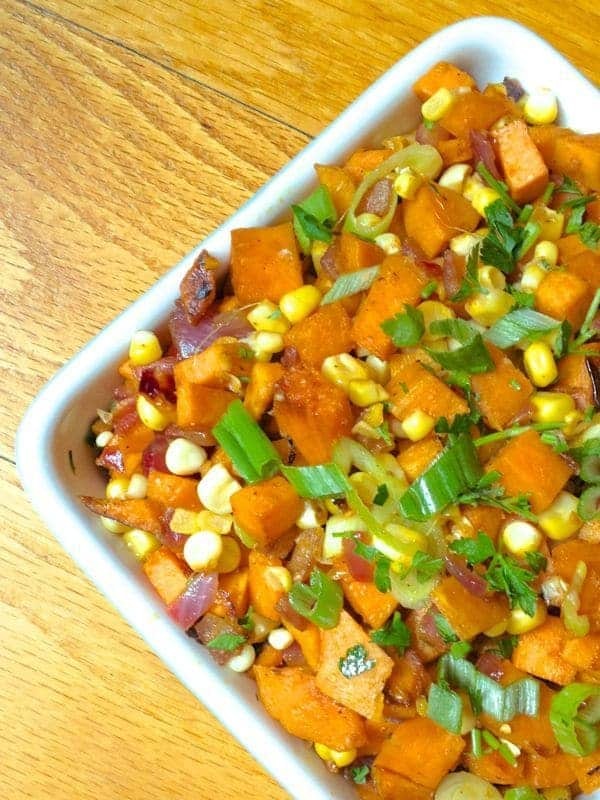 Sweet potatoes, yellow corn and red onion turn tender and sweet as they cook. For a bit of a kick, scallions, cayenne and smoked paprika are thrown into the mix. If you’re entertaining guests this holiday season, hash is naturally gluten and dairy free – ideal for accommodating various food allergies. 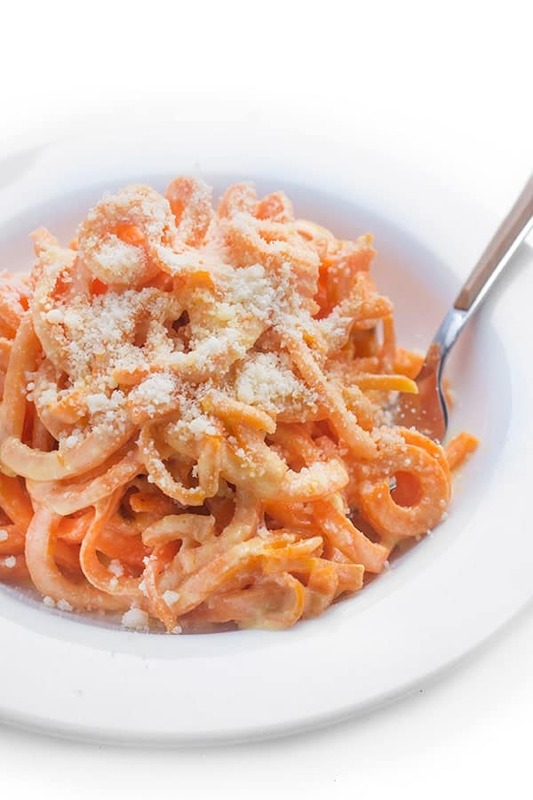 Simple, fast and flavor-packed, this dish is sure to please even the pickiest of eaters. As always, this hash is just a method that would work well with anything you have on hand from red peppers to yukon golds. Get creative and make it your own. Add sweet potatoes, onion, corn, salt, smoked paprika and cayenne. Cover pan and sauté veggies until softened, stirring occasionally, about 5-6 minutes. Remove lid and stir in scallions and parsley. Check sweet potatoes for doneness before serving. For more delicious side dish ideas for the holidays, check out these recipes created for Food Network’s #FallFest! 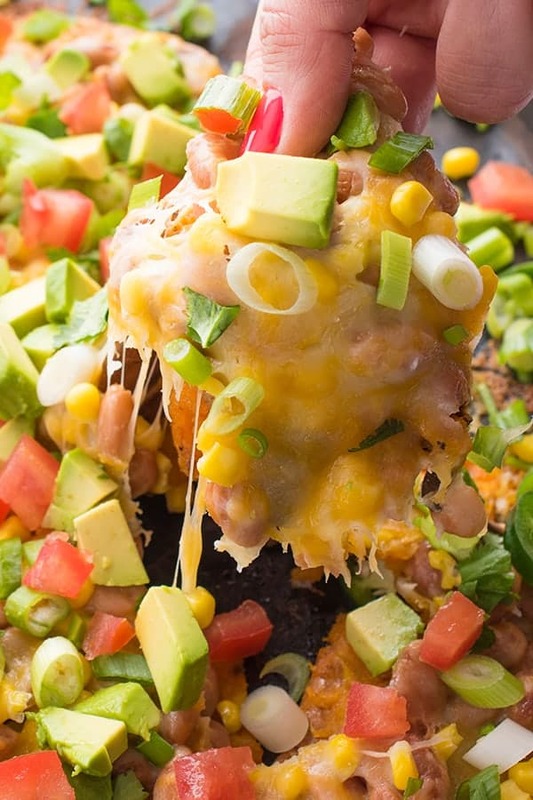 This looks great, but in wintertime is it ok to use frozen or canned corn? Thanks! Absolutely! Frozen would be great! Do I need to boil the sweet potatoes? No you don’t!! :) Enjoy! 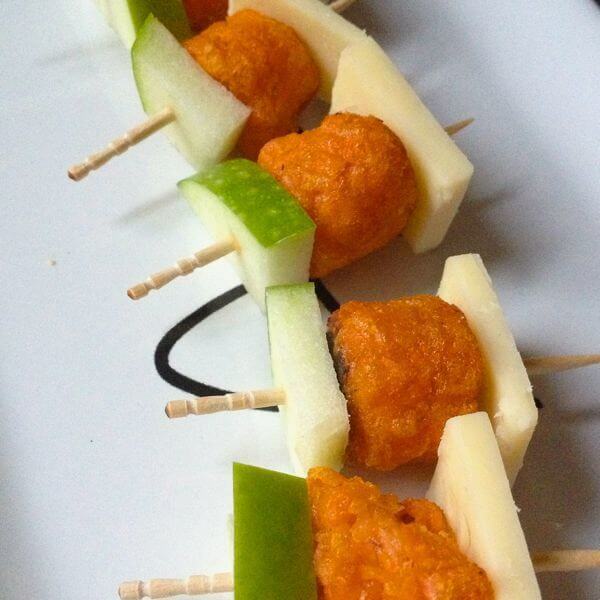 I seriously love the combination here – plus the addition of paprika? Genius! I’m such a huge fan of sweet potatoes and corn….Love this Liz! Same to you friend!! I hope you have a great Christmas! This looks so good! I think I would like it with a over easy egg on top…is that weird? Not weird at all!! Sounds fabulous! I love sweet potatoes. The egg idea sounds over-the-top yummy, too! I’m totally down for that!! I love this healthy side dish! Perfect for the cold winter months & it is pretty! Oh holy yumminess! I would dig into this with double forks for Christmas breakfast! What a delicious, cozy casserole for any meal of the day, Liz. Love it! YES!! I was just thinking I should put an egg on it next time!! Merry Christmas friend! This is so cozy and comforting! !